Need a simple side dish that's tasty and versatile? Stop searching - our Cheesy Broccoli Bake recipe is just what you've been looking for! 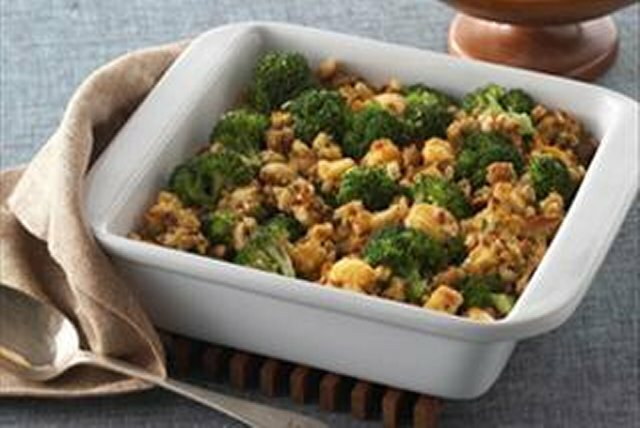 This simple vegetable side dish features broccoli, stuffing, cheese and bacon - need we say more? Bring 4 cups water to boil in large saucepan on medium-high heat. Add broccoli; cook 3 min. or until crisp-tender. Drain. Combine broccoli, remaining water and all remaining ingredients in 8-inch square dish; cover.